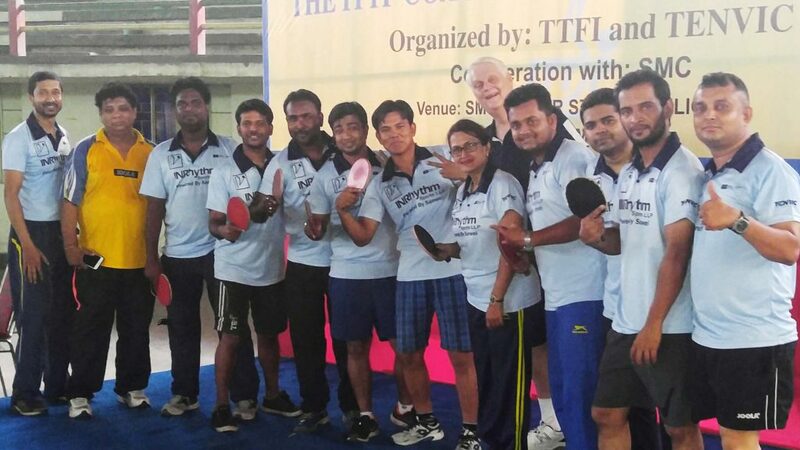 Located in the foothills of the Himalayas in the state of West Bengal, Siliguri was the host for a recent ITTF Level Two Coach Education Course; proceedings commenced on Sunday 14th May and concluded on Friday 19th May. Organised under the auspices of the ITTF Development Programme, it was the first such course to be held in that part of India. Conducting affairs was Richard McAfee, no stranger to India; he has conducted no less than 16 ITTF courses in India in the past five years. Overall 12 coaches took part including Biken Thapa, who most certainly seized the opportunity, he travelled from neighbouring Nepal. A most valued student as was Sabrata Roy, he was the local host and made absolutely certain that all matters were in order in a region of India from which of many of the leading players have emanated. Notably Soumyajit Ghosh, winner of the Men’s Singles title at the recent Seamaster ITTF Challenge Chile Open is from the state as is Subhajit Saha, Men’s Doubles gold medallist with Sharath Kamal Achanta at the New Delhi 2010 Commonwealth Games. Similarly, Ankita Das, Mouma Das and Poloumi Ghatak hail from the state. Motivated by Richard McAfee, all responded and gave total commitment; the outcome was that their efforts bore fruit; all passed both the oral and practical examinations at the end of the course. The most successful visit to Siliguri concluded this year’s Indian itinerary for Richard McAfee; the next stop will be at the other side of the world; in late June he is bound for the Bahamas.